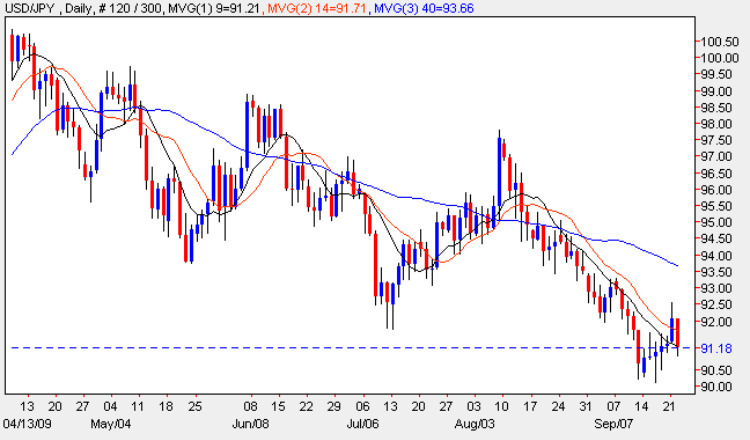 The yen to dollar pair confirmed once again how difficult this major is to trade, with Monday’s wide spread up bar which breached both the 9 and 14 day moving averages, having been promptly engulfed in yesterday’s currency trading session, ahead of the FOMC statement which is due for release later today. The session closed with a wide spread down bar which has now provided a bearish engulfing signal following the reversal higher of the last few days and closing marginally above the 9 day moving average which seems to have provided a degree of support to the move lower. With the Japanese markets closed for a three day national holiday, trading volumes have been thin, and with the markets nervously awaiting the FOMC decision, the volatility in the yen to dollar pair has been evident as a result. With such a strong technical signal however, we should see the yen to dollar fall as a result, possibly to re-test the 90.00 price handle once again, with a possible deeper move in prospect should this level be breached. With the market now cascading lower in a series of lower highs and lower lows, the bearish sentiment remains firmly in place at present, reinforced by the three moving averages which are all pointing firmly lower. With no fundamental news on the economic calendar for today in Japan, the yen to dollar pair will be waiting for the FED and in particular the rate statement for any clues or hints as to future monetary policy, and in particular whether we are likely to see any shift in interest rates in the short term. If this is signalled to the markets, then this could result in a surge in the US dollar as a result, with a consequent reaction in the yen to dollar pair.